A view over the city of Edinburgh in the evening from Calton Hill, Scotland, Europe. From Calton Hill above Princess street one have the best overview over the whole city of Edinburgh, the scottish capital. Especially in the evening hours, when night is coming to Edinburgh and all the lights are coming on, the view from above is spectacular. 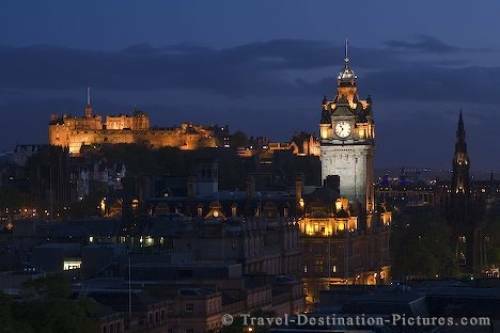 Picture of the Edinburgh Castle and Balmoral Hotel Clock Tower in the city of Edinburgh, Scotland, Europe.